Unknown3:12 PM 0 sweets for free! I was deeply involved in a conversation with friends when I realized that I am lucky I was able to live the prime years of my life in this century. This is the time when technology and creativity meet to fit my wants and needs in my lifestyle. I am a licensed CPA and I do obsess with numbers and analytics. I am also a Pole Fitness instructor and just a general health and fitness buff. Science and numbers fascinate me, and a few years back I struggled to measure my progress and my goals because I did not have the means to do so. All I could do before is count my steps manually (as in, in my head) because when I was younger I did not have even a pedometer with me. It's such a great time because now, there are lots of gadgets that I could use to track, analyze and be better to achieve my personal goals. I have received a Fitbit Flex for me to review and here are the things logged down after using it for 1 week! What is the Fitbit Flex wristband made of? I am quite sensitive to a lot of things, metal, dirt, dust, and so many other things that wearing a watch is kind of tricky for me. I was worried that when I start to sweat with the Flex wristband, that I would start to itch, but I didn't! I wear it with me all the time when I take a stroll in the mall, when I go to the gym and when I warm-up my pole class. The Flex wristband is made of flexible, durable elastomer material. Most sports watches usually use this material. It has a surgical-grade stainless steel clasp to secure the band to your wrist. I'm glad that the designers thought about this so I can wear it for longer periods of time. Sometimes I forget that it's there and I can sleep through without it bugging me. Tap rapidly for 1 to 2 seconds to start or stop sleep tracking. I don't even do this but it still tracks my sleeping activity. Water resistance. Fitbit Flex has been tested up to 1 ATM. This means it is sweat, rain and splash proof. This device is however not meant to be taken with to the shower or for a dive or swim. Tracks daily totals for the past 30 days. During the day, it tracks steps, distance, and calories burned. At night, it tracks sleep quantity and you can set it to wake you up silently in the morning. It works when you sleep with another person and you don't want to use the sound alarm to disturb them. You can encode your personal stats and set goals, and the app will do all the tracking work for you. Set goals, log food, see progress, analyze trends and earn achievement badges through your mobile and online dashboard. Share and compete with friends and family on the leaderboard and in NEW Fitbit challenges. The battery used is a Lithium-polymer. Charging time is 1 to 2 hours only and the battery life can last for 5 days. (In my case, it was able to hold charge for 7 days. Fitbit Flex syncs automatically and wirelessly to smartphones, tablets and computers. It can work with Android, Windows and iOS mobile phones using wireless technology. Keep the band dry and clean. If the band gets weat, remove completely and dry before putting it back on. Moisture breeds bacteria and germs. Rest your wrist by taking off the band once in a while. Charge accordingly. Unlike other wearable watches, the Fitbit Flex can be used for 5 days on full charge. That's what was said on their official website, but I was able to use it for 7 days, because I forgot the charging wire and I was out of town. Packaging is good and well-sealed. However, it was little bit hard to open. On the good side, you will know that the band is really secure and you should not worry about it slipping off your wrist and lose it. As for the wrist band, it was hard for me to snap the wristband to my wrist upon initial use. I guess the rubber needs to be warmed up. Suggestion, warm up the wrist lock by locking and unlocking it a few times before using it. What I love about Fitbit Flex is that it is stylish enough to be worn with my other accessories. Unlike the other fit bands that I use, the design is sleek, simple and not as attention-grabbing as its other sibling models that have a huge screen or watch. It fits perfectly and I love wearing it! 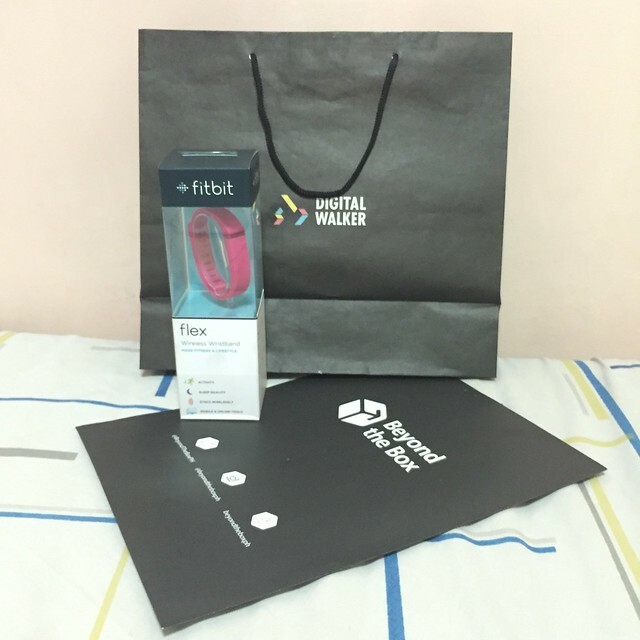 Where to Buy Fitbit Flex in the Philippines? Fitbit Flex is now available at Beyond the Box and Digital Walker.